Beauty Blunders happen to the best of us, usually at the worst possible time. Whether you’ve made a make-up blunder, run out of a vital product or simply stuck for inspiration, the following problems solvers will save the day. If you need to repaint your nails but have run out of polish remover, try coating one nail at a time with a clear base coat. Leave to dry for a few seconds, then press a tissue over the nail and remove it quickly – the base coat will adhere and the polish will come off in one quick move, and you are ready for a fresh coat of colour. If you are cursed with straight lashes you can actually train your lashes to curl with a daily use of an eyelash curler. A set of eyelash curlers can make a significant difference to the way your lashes look. To curl your lashes, gently squeeze your upper lashes between cushioned pads at the root, then crimp them and gently drag the pads along your lashes until you reach the end. Once your lashes are curled gently glide your clean finger along the edge to soften the curl before you apply your mascara. If you apply powder with a light touch to freshly moisturised skin, or on top of freshly applied foundation using a clean sponge, it should look flawless. If it doesn’t look flawless it might be the wrong colour for your complexion. It needs to match your actual skin tone as does your foundation. So try dusting a sample of the powder on your skin in natural daylight before purchasing it, if it doesn’t blend with your natural skin tone it is the WRONG colour! If your foundation keeps turning orange once applied try mixing 1 tsp (5g) of bicarbonate of soda into your loose face powder then dust the powder mixture lightly over your skin before applying your foundation. The bicarb will give your skin a slightly acid pH to prevent it from turning orange. This usually means the mascara it too old and the oils that give it a creamy consistency have dried out. This can be made worse by pumping the wand and pushing air into the dispenser. It is recommended you replace your mascara every 3 months. To temporarily revive an old mascara place the mascara into a glass of warm water for a few minutes then roll the mascara in between your hands. The immediate solution is to transform the blemish into a beauty mark! First, soothe the blemish by dabbing it with a gentle astringent on a clean cotton bud. This will dry out excess oils from the skin and help the beauty mark last longer. To create your beauty mark, dot over the top with an eyebrow pencil – this is better than using eyeliner as it has a drier texture and so is less likely to melt and smudge. finally, set your beauty spot with a light dusting of loose powder. If you’re out and about, and your lipstick is starting to melt, dust over the top with a little loose powder. This will give a slightly drier texture and help the lipstick stay put for longer. Loose powder will also create a lovely matte finish. Tidy your under-eye areas by dipping a cotton bud in eye make-up remover, Whisk it over the problem area to remove smudges, then repowder the area. A little loose powder over eyeliner will combat the smudging that occurs as the wax in the pencil melts. If you have redness in your skin tone it can be toned down by smoothing your skin with a specialised green-tinted foundation. You can also use a green-tinted concealer stick for smaller areas. Nowadays, skincare benefits aren’t limited to skincare products. In fact, many make-up products now contain UV filters and skin-nourishing ingredients to treat your skin as well as superficially improve its appearance. Apply with a light touch to the areas that need toning down. The green pigment in the cream has the effect of cancelling out the redness in your skin. Using a lipliner, will prevent your lippie from bleeding into the fine lines around your mouth. Trace the lip outline, then apply your lip colour with a brush. A drier-textured matte lipstick is less prone to bleed than a moisturising variety. To help your lippy adhere lightly dust your lips with powder before you start your application process. If your foundation seems to sink into your skin on hot or humid days, the trick is to apply it to cool skin. Do this by holding a cool, damp washcloth onto your skin for a few minutes, then apply your foundation using a damp sponge, don’t use your fingers as the natural oils from your skin will leave a streaky finish. Set it with a light dusting of translucent powder. To make your teeth look whiter, avoid coral or brown-based lipsticks as the warm colour will emphasize the yellow tones in your teeth. Clear pink or red shades will make them appear whiter. For a temporary fix, use eye drops to bring back the sparkle to your eyes. Eye drops contain ingredients that will reduce the swelling in the blood vessels, decrease redness and reduce dryness and itching. 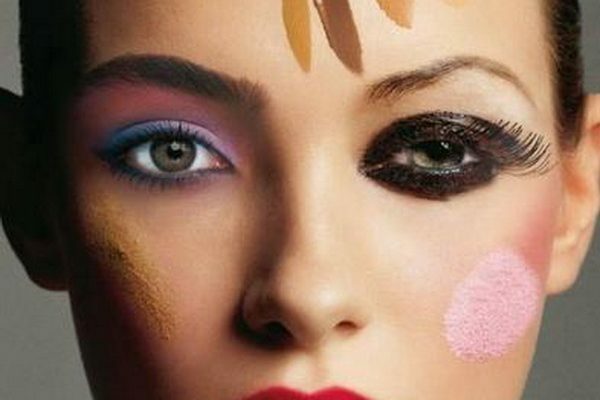 One of the most common mistakes woman make is not blending their foundation. If you can see the edges of the foundation on your chin, jawline or hairline, using a damp cosmetic sponge blend and soften the edges. Do this in natural light so you can check the finished effect. Apply your powder once you are happy with your results. However good your nails look, their overall effect can be spoilt by clear or yellowing tips. Yellow nails are usually caused by wearing dark nail polishes without using a protective base coat first. To fix yellow nails, rub with lemon juice to remove stains, then massage your nails with CND Solar Oil ™. You can also try wearing a paler colour every other repaint because they are less likely to stain your nails. If your problem reoccurs after wearing pale colours, consult your GP to check that their is no underlying issue. When applying your nail polish always make sure you use a basecoat first. To help lift droopy eyes, sweep a light toned eyeshadow all over your eyelid. Then apply a slightly darker shadow with a clean cotton bud under your eyes, sweeping it slightly upwards. Apply extra coats of mascara on the lashes just above the iris of your eye to draw attention to the centre of your eye rather than the outer corners. Women often don’t take notice of their eyebrows. They either look non existent or messy. If you want Brows that rock, go to a professional to have them shaped and coloured. If you have ‘barely-there’ eyebrows (which is very ageing to the mature woman) book a professional Tinting or Brow Henna session. Colouring your brows will make a huge difference to your face as it frames the eyes and will actually take years off. Blending is the key to rosy cheeks! If you have forgotten that you need to build your blusher slowly and gradually, you may need to tone down an over-enthusiastic application of colour. The quickest and easiest way is to dust a little loose powder over the top of the problem area, until you have reached a soft, natural looking blusher shade. If cheap earrings make your ears react, try coating the ear posts with hypo-allergenic clear nail polish. This should make them less likely to react with your skin.